Origin and Habitat: Parodia leninghausii is endemic to Rio Grande do Sul, Brazil. Altitude: It occurs at elevations of 300-1300 meters above sea level. Habitat: This species grows in hilly grassland and on walls between cracks in the rocks or in the shade of larger growing plants in pine forest. This species is abundant where it occurs. Many of its subpopulations have been extirpated. It grows in one of the most temperate region of the countries with warm and cool seasons and weather can become very cold during the winter nights, often it will fall to just above freezing without harming the plants as it is also very dry. The soil there is well drained and has a fairly high organic content, derived from the decomposition of other plants. 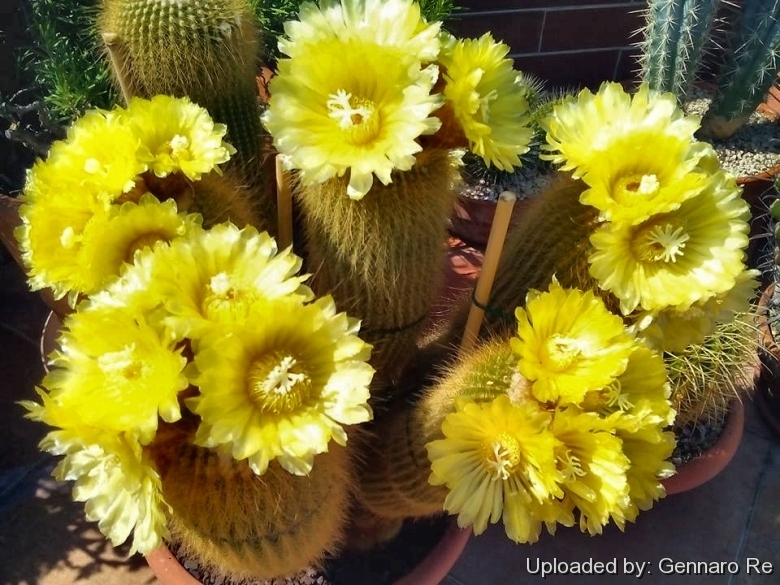 Description: Parodia leninghausii, still known in cultivation with its old name Eriocactus leninghausii, is a very popular cactus species appreciated because glistens under a haze of harmless golden spines and will produce silky yellow flowers, with a lovely reflection in the petals only when mature (5 years or so), but the blossom in summer is worth the wait. Sometimes, they present monstruous amd cristate forms. 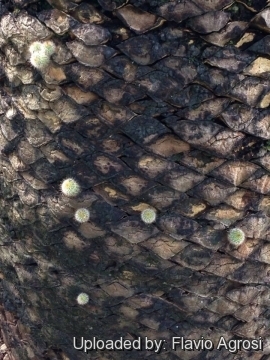 Habit: It is a shortly columnar cactus that branches and will start to cluster from the base as it ages. Stem: At first globular then columnar up to 60(100) cm tall, 8-12 cm in diameter, with an angled crown. Spines: Harmless, golden and bristly. 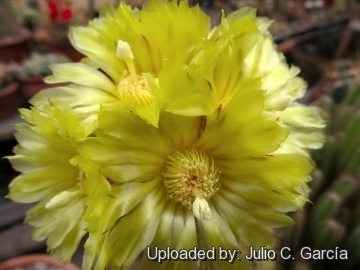 Flowers: Near the top, 5-6 cm in diameter pure yellow, silky, shining with a lovely reflection in the petals. Blooming season: It blooms only when mature (at least 20 cm tall) in Spring to late Summer. Blooms more than once a year. 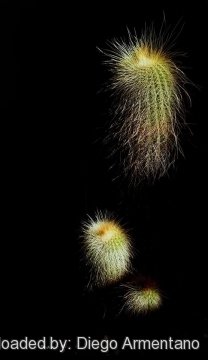 Parodia leninghausii (K.Schum.) F.H.Brandt: Short columnar Cactus that branches and will start to cluster from the base as it ages. 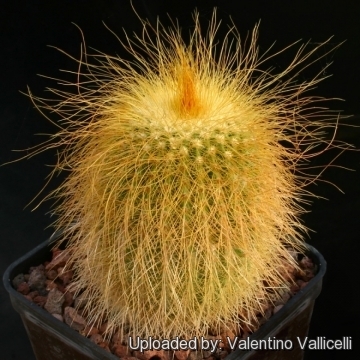 It has has bristly golden spines and will produce silky yellow flowers. Parodia leninghausii f. cristata hort. : crested form. Parodia leninghausii cv. albispina: has creamy-white spines and pale yellowish flowers. Parodia leninghausii cv. brunispina: has amber or brownish red spines and golden flowers. 6)Larocca, J. & Machado, M. 2013. 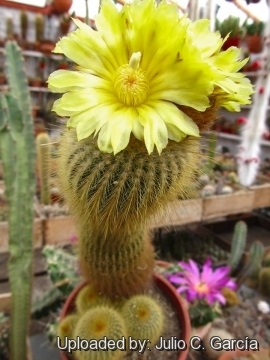 Parodia leninghausii. In: IUCN 2013. "IUCN Red List of Threatened Species." Version 2013.1. <www.iucnredlist.org>. Downloaded on 29 October 2013. 7) Urs Eggli, Andreas Hofacker: "Validation of the Name Parodia lenninghausii (Cactaceae), with a Note on the Lectotypification and Orthography of the Name". In: Novon. Volume 20, number 1, pages 30–32, 2010.